It's also perhaps the right time to think beyond juiciness, a specific type of commercial game feel about "maximum output for minimum input." Every semester I assign the famous Juice It Or Lose It talk by Petri Purho and Martin Jonasson, which begins with a basic game prototype that gets increasingly juicy with more particle effects, sounds, and layers of polish. JW's The Art Of Screenshake talk extends juiciness into a game design methodology, where he tunes the game to feature higher shooter rates and higher enemy counts with fewer hit points. This is a clear argument for expanding game feel to "whatever affects the feel of a game", which could be game design and spawn counts in JW's case, or as I'm about to argue in a few paragraphs, expanding game feel to encompass politics (which we certainly feel in games! a lot!). And let's not forget immersion. It's a very heavy loaded word with a lot of baggage, but key to contemporary discourse about how games feel to us. Immersion is when we "feel" like we are there, and we grow more aware of the virtual environment, for one reason or another. These days, the I word routinely gets dragged through the street by a desperate VR / AR / XR industry to try to market their headsets, and before that, the I word was the territory of AAA games claiming gritty photorealism and "cinematic" feel, whatever the hell that means. But if you want to understand immersion in its original formulation before all those marketing murders, you can read Janet Murray's Hamlet On The Holodeck, where she makes many canny predictions about using computer simulations as storytelling machines. Lastly, we need to talk about the rigidbody, the basic unit of video game physics. A rigidbody is a physically simulated shape that cannot deform and has no softness, it is a body that is rigid. While rigidbodies are much simpler to process and calculate than, say, soft bodies, this need to simulate many rigidbodies all at once lends itself to a certain type of game. What about the games that would rather spend all their physics cycles on a handful of soft bodies, instead of a hundred rigidbodies? Why don't physics engines support that? Even though I barely understand the idea (haha) I'll just go ahead and appropriate this notion of carpentry away from Bogost (I'm sure he won't mind) and try to coin some kind of "queer carpentry"... A queer carpentry could account for queer moods and feel of the creative process, and we would make things that help queer people do queer stuff. We can also interpret the call to carpentry more literally, and focus on tools. What would Gay Unity look like or feel like? What are queer tools, and would a queer tool make a queer game? Are non-queer people allowed to use queer tools, and if so, how would that affect how the object feels to us? 2. Gaze in feminist theory, as coined by Laura Mulvey, is about the politics of being looked at / the politics of looking. In video games, we usually treat looking as a "free" action without risk or consequence, which I explore in my game The Tearoom. 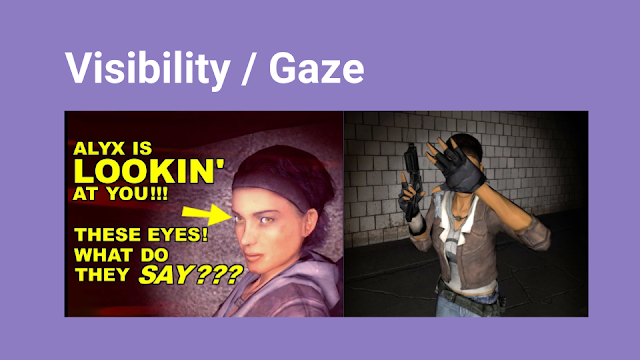 I'm afraid there are few other examples of gaze in video games, but one sequence in Half-Life 2: Episode One does stick out in my memory. 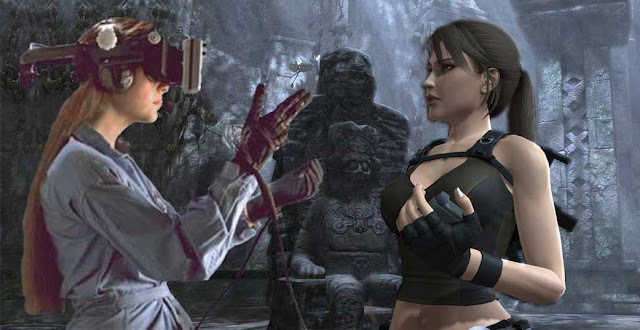 While exploring a dark tunnel with your AI companion Alyx, you are the one with the flashlight and Alyx is the one with the gun. You need to shine the flashlight on stuff to get Alyx to shoot it. However, you can also shine the flashlight directly in her face, blinding her, causing her to hold her hand in front of her face. When this happened to me, I was stunned -- here, a game character was reacting to the literal glare of my gaze. Not only that, but she was resisting it, refusing to do anything else until I looked away or turned off my flashlight. My favorite comment is the last one. She can't be blinded after being blinded! Valve tuned her to be blind and annoyed, but only when it is convenient for the player. Knowing this makes her reactions feel very different to me now. 3. I don't have a lot of fancy academic things to say here about softness. (If you have any good theory about softness / deformation, drop a link in the comments!) If you watch the video above, you'll notice weird gelatinous rabbits and a nutella simulator. I'm claiming all of these on behalf of queer culture. The rabbit's viscosity is your gender; the nutella is your star sign. Now, I will say that softness and deformation are still very difficult to do in every game engine. Why is that? I argue that it's difficult because we let it be difficult, and in video games we haven't invested ourselves in softness. If there was more demand for more game dev research in softness, I'm sure we'd have a lot more tools and methods to work with! It's only hard because we privilege hardness and rigidbodies, in the typical video games we make: you don't need sophisticated deformation if you're sniping people 5-50 meters away. But this is bizarre. Human bodies are basically huge sacks of water! Our muscles deform so much with even the smallest of gestures! Also, consider this: hardness cannot be meaningful without a possibility of softness. 4. "Bleed" comes from Emily Care Boss, a Nordic larp designer, and it's an amazing concept. Bleed is about your real-life identity and experiences "bleeding" into your in-game character ("bleed-in"), or your character's experiences and emotions transferring back to your real-life ("bleed-out"). 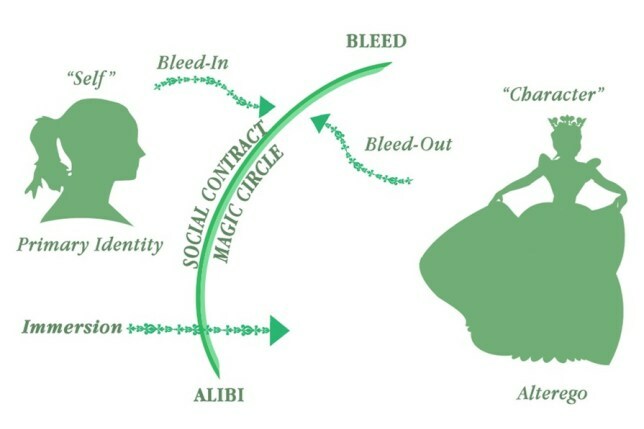 There's also the idea of an "alibi", which is the personal fiction that lets you negotiate the magic circle and perform as your character. Admitting to bleed is a little controversial in US larp communities. It suggests that you've lost control over the play boundaries, and you are giving yourself over to "immersion" (immersion is often a dangerous thing in larp!) which means you might hurt yourself or hurt someone else in the game. But that's also the beauty of bleed. It is a messy thing, it is a body thing, it is also deeply personal. It is also a much better account of immersion / magic circle than catch-all terms like "empathy", allowing for very complicated ideas of transfer and experience, while also accounting for psychological effects of roleplaying. 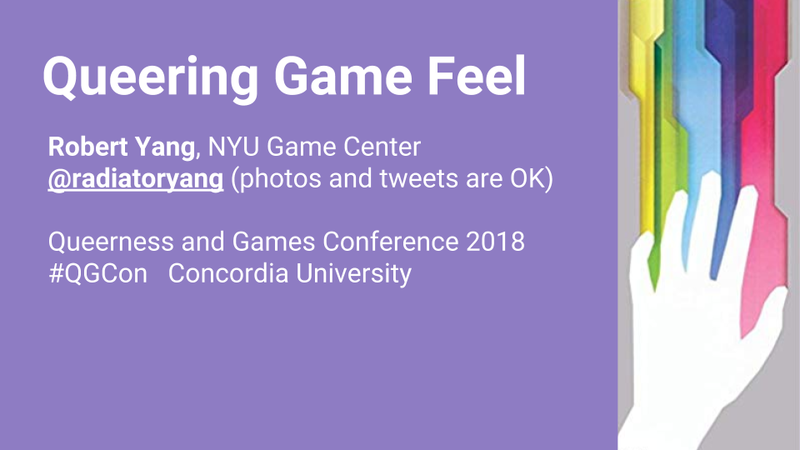 I strongly believe we should (1) de-stigmatize discussing larp / roleplaying in our communities, and (2) embrace bleed / other larp theory innovations in video game land. Thanks for reading! Now let's go queer some game feel.